Lichtenberg figures (sometimes called lightning trees) sometimes occur when an electrical charge is introduced to an insulating material, representing the branching electrical discharges. They can occur in resin, glass, grassy fields, and, if you're unlucky enough to be struck by lightning, human skin. 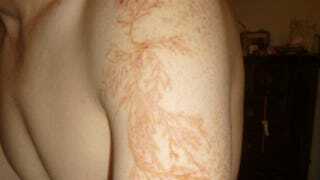 This particular Lichtenberg figure belongs to Winston Kemp, who was struck by lightning last year. Apparently, he didn't realize he'd been struck during a late spring storm until the marks appeared on his arm an hour later, and he didn't seek medical attention. Lightning can cause cardio-pulmonary or neurological trauma, but apparently the only side effects Kemp suffered was a sore arm and these marks. After a lightning strike, Lichtenberg figures generally last only a few hours to a few days, but Kemp still had his a month later, although they had faded to pale pink. He got struck by lightning and all he got was a less awesome version of his original scar.